Get 10% off + Free shipping on orders over $100. 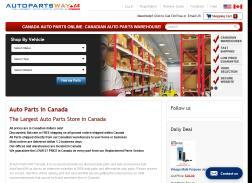 Get up to 78% Off Dorman Exhaust Manifold. Get Up to 77% Off NPN Disc Brake Pad. Get up to 46% off Auxiliary Air Regulator. Save 5% off your total purchase. Get 10% off Genuine Exhaust System Hanger Kit. Get 10% off sitewide plus free shipping on orders of $100 or more. Daily Deal! Get 40% off 400A Peak 12000mAh Portable Car Jump Starter/ Auto Battery Phone Power Bank + Free shipping on orders over CAD $100. Save $5 off your total purchase.